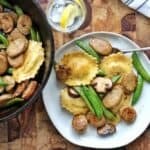 A one pan Chicken Sausage Ravioli recipe packed with peapods and mushrooms with a delicious lemon flavor. A 20-minute dinner recipe you need to try! This recipe utilizes convenience foods to make it a super quick dinner recipe. Chicken sausages are sauteed with peapod and mushrooms while the ravioli boils. This recipe comes together with a touch of butter and freshly squeezed lemon juice. It’s a family favorite at my house, I hope your family will enjoy it just as much. 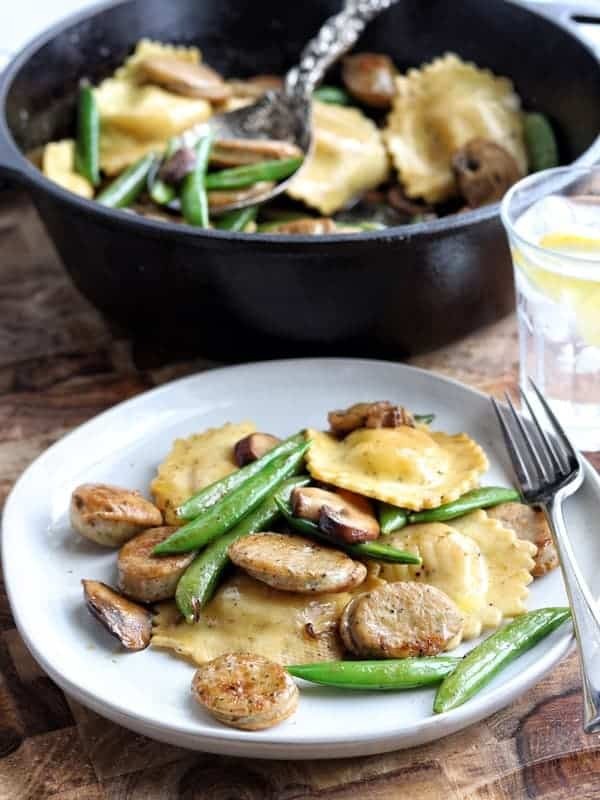 A 20-minute dinner meal utilizing chicken sausage links, ravioli, pea pods, and mushrooms. A simple and delicious quick meal idea. Heat olive oil in pan over medium heat. Add chicken sausage let brown, about 2 minutes. Boil ravioli for 7 minutes, then drain. While ravioli is boiling, add pea pods and mushrooms to chicken sausage, stirring often. Cook about 5 minutes. Add butter to the chicken sausage and vegetables. If you enjoyed this recipe, make sure to check out the following recipes! This was flavor filled and so easy! Loved it!